When I was a senior in high school, I was editor of the school paper. I wanted to publish more than fluff pieces. I couldn’t count how many times the formulaic headline “[insert school event here] a Success” showed up in that paper. Some of the articles ended up quite controversial, and I got us in trouble quite a few times. I was the reason why future issues of the paper had to be approved by the principal. And while I can be proud that, after years of people complaining, my paper resulted in actual changes to the cafeteria food quality and pricing, I did have one article that poked fun at past administrators that got me pulled into the principal’s office. I was told that I needed to write an apology for the next issue. I remember writing the words, “We regret any offense we may have caused.” It sounded good and official, as if it was something in a real newspaper. And I remember being told that my statement wasn’t good enough. It’s not an apology to “regret” that someone was offended. It’s basically saying that we’d do it again and that any offense is the responsibility of the offended. So I had to rewrite it: “We apologize for the offense we caused.” It’s a lot more direct and lot less weaselly. An apology isn’t something you say to make bad feelings go away. “I’m sorry” isn’t a magic phrase to get people who are upset with you to disappear. And you don’t apologize with a non-apology such as “I’m sorry if you were offended” because you’re basically saying that you’re not sorry you did someone something wrong because you don’t think you actually did. According to Ars Technica, slave-Tetris mode was removed from Playing History 2: Slade Trade by Serious Games Interactive after a public outcry when the game became more well known due to a Steam sale. Ugh. I did just type those words, didn’t I? Slave Tetris? Really? Someone thought it was a good idea? I have no problem with a game being used to educate players about history. And no one else who understands how games aren’t just for kids has a problem with the concept either. But Slave Tetris isn’t the most respectful way to teach how horrible the conditions of the slave ships were. This isn’t navigating the Dalles in The Oregon Trail. You can’t reduce the real experiences of millions of people to a mini-game and not expect people to feel that those lives themselves have been minimized. This phrase makes it sound like the Slave Tetris minigame is actually quite sensitive and perfectly fine, but because some people took offense, SGI decided to take it out to make the bad publicity and bad feelings magically go away. Furthermore, I have a feeling that many of the negative reactions in here are knee-jerk reactions and she eps following what other says. Please take time to look at the game before forming your opinion. People are offended, and it isn’t the Race Card or Political Correctness or people who are just looking to get offended professionally. He made a mini-game about earning points by stacking human slaves efficiently in a slave ship. It’s offensive. If there was a mini-game about slamming planes into the Twin Towers and scoring points for the number of people you force to jump to their deaths, people would be offended because it is offensive to take such a serious situation and try to pretend there’s a fun game out of it. There would be real lives being represented in a terrible way. The seriousness of that day would be missed, no matter how accurate or true it technically might be. I agree with Egenfeldt-Nielsen that games have a lot of potential beyond being fun. In fact, there are plenty of serious games out there on a wide variety of topics that the casual game player might get surprised about. There are games about dealing with cancer, depression, and many other health issues. There are games about current events, war, and logistics for aid organizations, all of which treat the topic seriously and can bring awareness without making light of the situation. But as I’m sure he has discovered, it’s not easy to work with serious subjects. You can’t separate the game from the people and events it is portraying. 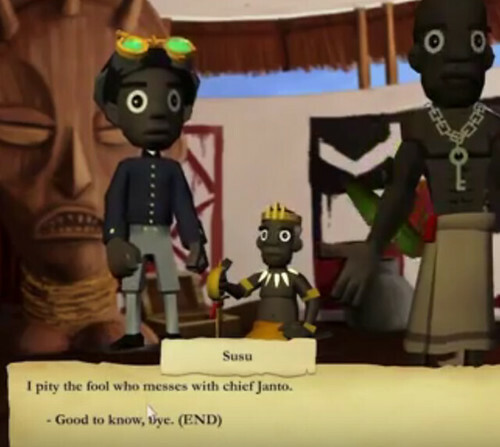 A game about slavery can’t just be game mechanics with a slavery backstory. To think otherwise is to betray the mindset that this serious issue is serious in the abstract but not serious enough to consider other people’s reactions to it as important. Slavery is horrific. A game about slavery need not be, but Playing History: Slave Trade‘s Slave Tetris isn’t driving home the point that slave ships were actually like a Tetris board. In a subtle way, it’s minimizing the horror. But I worry the lesson he learned isn’t to treat serious subjects with more respect and awareness. I worry the lesson he learned was that he needs to walk on eggshells to avoid having seemingly unreasonable people offended. His regret is that others were offended, not that he participated in the offending.